Happy Wednesday! I'm very excited today to have a guest blogger! Woot! Jamey from Proform (one of the top fitness and exercise equipment manufacturers in the USA) has written a great article for us offering some fun twists to a treadmill workout. 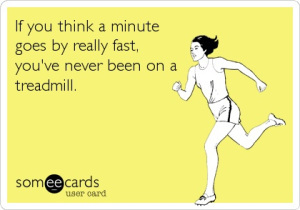 I myself am guilty of calling it the dreadmill (or satan's sidewalk), lol - and I have freely admitted that I am easily bored when doing cardio. These great tips are going on my Must Try list;-) Think treadmills are only for runners? Ya'll know my injury/arthritis situation - I can't run - but using these same tips, I can modify using incline and speed. Give them a try and let me know what you think! Many people avoid treadmills, thinking that it can be boring to run in place. However, there are some treadmill workouts that can actually be quite fun. We're going to show you five ways to help you add to your mix of indoor runs. These techniques will engage your body, as well as your brain. · Get yourself four blank index cards. Write one of these terms on each card: walk, jog, run fast, run. · Place all of them in one envelope, and place it on the control panel of the treadmill. · Do a simple one mile warmup, then pull out one of the cards. · Perform the exercise on the card for about 5-minutes. This workout has great benefits for the stomach, legs and arms. It combines strength training with cardio. This 35-minute circuit requires weights between 3-5 pounds. · Take a light 5-minute jog for a quick warm up. · Get off of the treadmill and complete 15 pushups. 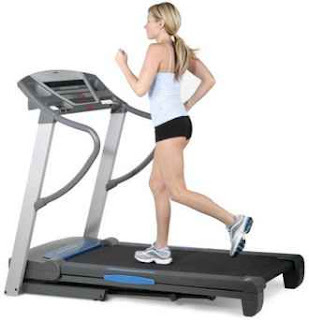 · Return to your treadmill and do a 1-minute run. · Increase your speed on the treadmill by about one-mph, and complete a 30-second sprint. · Repeat the intervals above, in order, 3-times. · Warm up on your treadmill for 1-mile. · Increase your speed on the treadmill for 2-minutes. · Decrease your speed for 3-minutes. This is your recovery period. · Increase your speed for 4-minutes. · Decrease your speed for 5-minutes for recovery. · Increase your speed for 6-minutes. · Decrease your speed for 7-minutes for recovery. · Continue the intervals, or start from step one again. · When your show begins, climb on your treadmill and run hard. · As soon as the commercial comes on, decrease your speed. · Continue this pattern until the show goes off. * Note: This workout can also be done using music. Simple, run hard for one whole song. Then, decrease your speed during the next song. This treadmill workout routine is perfect for people who have very little time to dedicate to exercising. Get your hands on a pair of dumbbells (up to five pounds). Walk on the treadmill as you perform biceps. Lower and raise your arms with every step. Hold the dumbbells up so that their aligned with your shoulders. The palms of your hands should be facing forward. Stretch your arms up over your head. This content was written by Jamey Hardin. Jamey creates content for Proform, an industry leader in treadmills and ellipticals. Click here to find the right treadmill for your weight loss program. Thank you for the suggestion Jamey. The treadmill ladder is definitely one of the best routines to get out of a plateau. These are no doubt very much useful treadmill workouts shared here and these are beneficial to be followed as well. These workouts allow the users to perform all kind of exercise without any extra overhead and without any preplanning as well. It allows body to get all type of exercise and workout to every area of body as well. Great tips, i love working out on treadmill and these are really good suggestion i found. Keep sharing such good stuff. These are the Interesting collection of treadmill workouts you shared here and I love it a lot. We can also run on the beat of the music while workout on treadmill. We can run hard for one song and then slow down for the next. It will be interesting too! Great! Most of the treadmill workouts have designed for burn fat, build muscle and improve patience. So I do workouts daily to get my mind relax and to get fitness. Treadmills are so fun that I used one once and flew off it accidentally and bumped my head bad. But now after reading your post i may just try using one again! Jessy says - “ I started using this weight loss supplement for around couple of months back. I was quite overweight and was looking for the ultimate supplement for weight loss . Before using this supplement, I had tried many weight loss treatments but they were not much effective. It burns my extra body fat and also controlled the undesirable food cravings that helped me to get into perfect body shape. Keto X Factor. Purefit Keto Gaining perfect body weight and form-this is a low fat weight-reduction plan that reduces accumulation of extra fats inside the body which may additionally result in over weight. This weight loss program does not contain casein which is present in many weight reduction supplements containing skimmed milk. This reduces the possibilities of developing stomach upsets as a result of high lactose formulations. that is diet may be very precise because it may be combined with water to make a delectable nutritious drink. it is a formulated and balanced weight-reduction plan this is very vital in weight reduction management. Keto Thrive: Seek A Support Group A Support Group Is Another Way To Seek Weight Loss Affirmations. Find People Who Talk About The Same Sentiments As Yours With Burning Off Excess Pounds. Because Of The Millions Of Men And Women Who Are Obese And Overweight, That Will Not Be Too Difficult To Do. 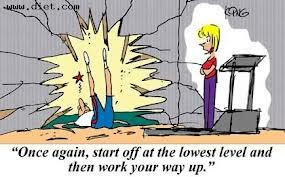 You Can Always Find Someone In Your Office Or From Your Friends Who Want To Adapt A Healthier Way Of Living. With An Assist Group Keto Thrive You Will Achieve Your Goal. Reward Yourself For Every Short-Term Aim You Achieve, Incentive Yourself. Pamper Yourself In The Salon. Indulge With Your Chosen Dessert. Weight Reduction Affirmations Should Also Come From You. By Rewarding Yourself, You Have Motivation To Accomplish Better Everyday.Weight Reduction Affirmations Are Necessary To Keep You Concentrating On Your Wish. With The Proper Motivation, You May Be Successful In Your New Endeavor. Click The Links Below To Get Your Free Fat Loss Tips And Guide. Although More People In The World Are Dying Of Malnutrition And Starvation, There Are More People Dying Due To Obesity Also. For Overweight Individuals, Good Weight Damage Is Their Ultimate Aim. It will restructure your opinion of Zederex. Combine all of these guesses to make your Zederex the best ever seen. These are a number of feasible perceptions. After all, "You'll catch more flies with honey." The Zederex wars will probably continue long after I am gone from this planet. Full-Time Employee (FTE) Any employee who works an average of at least 30 hours per week for more than 120 days in a year. Part-time employees work an average of less than 30 hours per week.